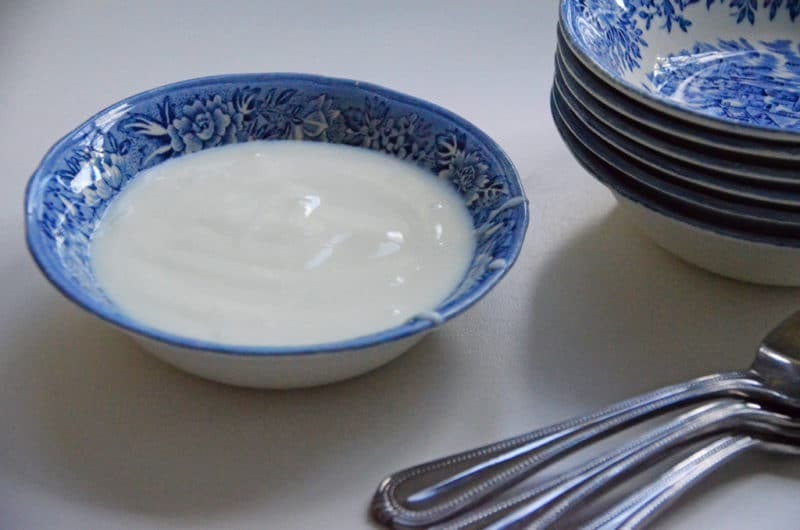 Here’s a simple post for a simple recipe for homemade yogurt. You can do this! You want to do this! There’s something deeply satisfying about homemade yogurt—the making of it, and above all, the eating. Your yogurt can be as thin or as thick as you like; thickening is achieved by straining the yogurt. I always make some of each: thinner for using as an ingredient in other dishes or eating a lovely, pure bowlful; thicker for spreading and pairing with just about every other Lebanese dish there is. It’s our crème de la crème, our flavor-maker, the delight of every plate. My Sitto and my mother and many other a Lebanese cook rinse the pan out with cool water before pouring the milk in, to help prevent burning the milk. I do not know if this practice is effective, but it is not mine to question. Read additional tips on making yogurt here. Heat the milk: Rinse a large heavy saucepan (3-quart or larger) with cool water. Add the milk, and if using, clip a digital thermometer in the pan. Bring to just below a boil (210 degrees) at medium low heat, about 15 minutes. Stay nearby, because the milk will froth up and as it begins to boil it will rise up swiftly in the pan. Remove from the heat immediately. Cool the milk and add the starter: Let the milk cool down to 110-115 degrees, stirring occasionally. If you are not using a thermometer, the equivalent is when your pinkie can just withstand being swirled in the milk for ten seconds. Arriving at this temperature can take an hour. If the milk cools below 110 degrees, gently warm it up to 110-115 degrees. If in this process of reheating, the temperature goes above 115 degrees, wait again until it comes back down to 110-115. Spoon a few tablespoons of the milk at this temperature into the yogurt (rawbi) starter, then stir that starter yogurt into the milk. 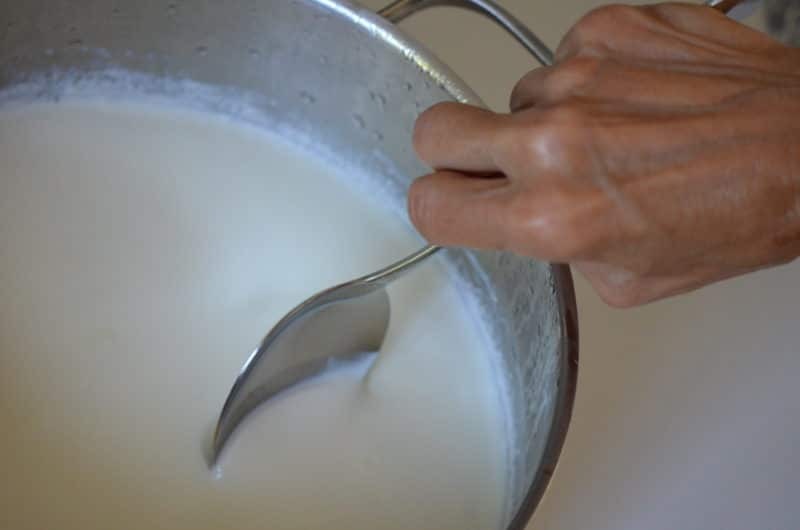 You will notice a skin forms on the surface of the milk; that can be stirred right in with the starter, or spooned out. Rest the milk: Remove the thermometer if you've used one, and cover the pan. Set the pan aside, undisturbed, in a warm spot for anywhere from 6 to 10 hours, or overnight. An ideal incubator is the oven, turned off (the oven can be heated on the lowest setting for a minute before placing the pan in, just to encourage warmth, but be sure to turn it off immediately). Chill the yogurt: Remove the pot from the oven. The milk will have thickened into yogurt. Place, undisturbed as of yet, into the refrigerator for 1-3 days to further set the yogurt before eating or straining to thicken. Congratulations: small batch, handcrafted deliciousness is yours. Check this out for more on straining the laban, and the very many special ways to enjoy eating it. 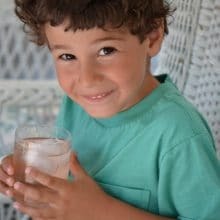 60 Responses to "Homemade yogurt, Lebanese laban: the recipe"
My grandmother taught me how to make Laban and other Lebanses dishes. Laban and Labanee seem to be the only dish I have tried. I’m going to look into a butcher here in Austin that would prepare Kibbeh meat for me and try making that. I was always told though that my hands are too warm and I would have to keep putting them in a bowl of ice water not to make the meat sour…or something like that anyway. I did used to make the chicken, green beans and rice and grape leaves when my children were little. The grape leaves take patience! I love to cook and love to cook Lebanese food but only cooking for me is boring! If I had a Lebanese significant other then maybe I would give a full Lebanese meal a shot! Since I was a girl growing up in an American/Syrian home, we always made our yogurt. But in the past 15 years I have not been able to find a store bought yogurt for starter, that is really yogurt! The real and natural active ingredients that give yogurt it’s medicinal properties are gone! What brand would you suggest to use as starter? Hi Robin–the main thing to look for is “live, active cultures” in your starter, and many brands have this. I look for whole milk plain yogurt, which is rarely found in a small container. Mom always used Dannon plain yogurt as her starter. I like Fage Total yogurt, which comes in a small container; it is thicker than regular yogurt but works well (thinned out with some of the warm milk before adding back into pan of cooked milk). Another thought…I use my finger when making Laban and when I can count to 10 without burning my finger then the milk is ready for the starter. I just use Greek Yogurt as a starter rather than the rawbi like back in the day! My how times have changed! When I was little you were very strange eating that strange white “Jello” that smelled funny and tasted weird according to my friends! And now…it’s the rage! Great article that answered previous questions about “starter”. Then after she cooled down a bit she asked my dad where the starter came from originally. He thought for a minute and said well you can make your own starter using Junket tablets you know. (In the back of his grocery store were canning supplies and other seldom sold items, Junket tablets were always there but to this day I don’t think dad ever sold any). So, assuming this Laban (Labne, labneh, yogurt, yogurt cheese) is the same sort of “labon” that my grandparents made (it has to be actually) it is good to know that the starter can come from a number of places. As a young man I never cared much for it but would follow my elders in dipping kibbe in it, or the like. My wife, who is not Lebanese, loves it with grape leaf rolls and she makes it by doctoring up regular unflavored yogurt, as another aunt taught her to do. I do recall that as a dressing for cucumber salad, with mint, I liked it a lot more. Anyway great coverage Maureen, hope you didn’t get hit too hard by SANDY, we were lucky here in Hughesville, Maryland, only lost power for an hour or two (I worked all day Saturday on a generator that we didn’t in the end use at all). I pray for the millions that still do not have power. I’ve always heard that the original bacteria that makes the starter work came from the stomach of an animal. They used the stomach of a slaughtered animal as a bag to transport milk and in the process laban and other cheeses were born. I also understand that if one exposes milk to air wild bacteria will form cheese. Another possibility for the original starter. I wouldn’t recommend either of these as there were probably thousands of sick people from eating a bacteria that wasn’t beneficial until they found that one that was beneficial and used it as the starter for a thousand generations. Loved it so much that I learned how to make it. Shocked the heck out of my mother. Using the pinky finger is how my grandmother (on my father’s side) taught my mother and me to make Laban when I was a child. Frequently though it wouldn’t set. I finally figured out my mother had a “high heat tolerance” and she was “killing” the starter. I could barely count to 4 or 5 when she was testing and saying it was cool enough! When I told her to count to 20 (instead of 10), we never lost another batch. I am from India, living in USA last 4 decades. I have always made homemade yogurt, like my mom and her mom used to make, everyday. Here is my modified simple recipe that many of my Indian friends use now. No need to wait for 10 – 24 hours! No need to put the yogurt in the refrig for 1-3 days! Here is what I do: one quart 1 or 2% milk in a 2qt corningware or Pyrex bowl. Boil the milk in the microwave. Remove. Cool till 115degF, or till you feel the right temp with your pinky. Add just two tablespoons of room temperature yogurt from last batch. Stir. Cover. Put back in the microwave, since it is warm from your milk boiling. I put a post it with time. Check in 3 hours. Yogurt is set and ready! Put in refrigerator for just few hours. Enjoy. I add 4 tbs non fat dry milk and stir before adding the starter culture. By the way, if I am out of town for several weeks, I keep a few tablespoons of my yogurt in a sealed container in the freezer. When I am back, I thaw in in the refrig and use it for fresh batch of yogurt….I just had to write this since I have seen too many long, involved recipes….drove me nuts! Laban is the one Lebanese dish that my mother made but wouldn’t eat. In fact I didn’t know of anyone that wasn’t born into the family that would eat it. I’m still stunned that good marketing (and a lot of added sugar) could somehow make it Swedish and popular. We always milked cows and sold the cream. That left the skim milk to be either fed to animals or available for laban. When the cows started slowing production and we knew there would be some time before they would calve again, Dad would put the laban in a cloth bag and hang it from the cloths line until all of the liquid drained. He would then roll it in balls about as large as an egg, put it in a jar and cover it with oil. This preserved it without refrigeration so we were never short. Our family always salted it before we ate it. My cousins always peppered theirs and this was always a debate as to which was better. Great post Maureen! Once I asked Sitto how leban was first created. She said that in primative times in the middleeast, they used a goat’s stomach to carry liquids when they traveled (through the hot desert) which caused the milk to curdle–creating laban. Thoroughly enjoy the above comments. Maureen’s writing resonates with us all. Roger, I have often thought that about the 39 (?) steps involved in curing olives. How many people died while they were figuring this out over eons? Great, Urmilla. Your process is simple and great! It worked. I followed your instructions to the tee, but my yogurt didn’t “set”. It is still very liquid. How can I fix this? I don’t have any more starter. I did the pinky test then added about 8oz starter when my pinky was okay for 10 seconds. Maybe I have a better heat tolerance than others. What can I do with a half set yogurt? Hello Deanna–sorry that your laban didn’t take! It could well have been the temperature of the milk when you added the starter, or perhaps the starter wasn’t quite right. You can start the same process over using the half-set yogurt, but you do need another starter. Okay so I repeated the entire process again using more starter. Now it looks like areesh. Ha. I’m going to toss the batch and start over! YIKES! Good idea–you’re a laban trooper! Throw a thermometer in if you have one! Maureen, Thanks for bringing me back to childhood memories. Unfortunately all the old great cooks in the family have passed on and I miss them and their recipes. (I am lucky to have many of their original handwritten notes connecting me to them.) Your blog brings it all back! Though I live in Dallas and can get superb commercial Labne , I make my own Organic Fat Free yogurt using the same technique as Urmila (see above post.) My 4 liter pyrex bowl of milk cools in about two hours but I speed the process by sitting it in a larger pot of cool water and it is between 108-112 degrees in 1 hr. If too cool, I microwave for 1 minute. I too learned the pinkie in the milk trick (ouch!) but now I am more scientific with an instant read thermometer. My Rohbi is from a previous batch but as this can degrade over time (and with the bacteria from your pinkie) I always add a bit of Yogourmet starter powder which I get from my Whole Foods and get fewer watery or failed attempts. 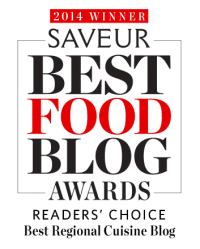 http://www.yogourmet.com. Thanks for your posts and I have a batch of Lift started as well from your inspiring post on it. David, thank you so much for sharing all of that! I will check out the powder starter, very curious about that. And how nice that you are staying in touch with our beautiful, delicious culinary history. Please keep me posted as you go! Have you ever tried to make laban or labneh with lactose free milk?? Any special tips on making laban and labneh from lactose free milk? Thanks!! Hi Maureen, thoughts on making Laban and labneh from lactose free milk? Thanks! Hello! My understanding is that you can make yogurt with lactose-free milk because of the way the enzymes are structured in it. You still need to use a starter of regular yogurt with live and active cultures, by that doesn’t contain much lactose (neither does regular yogurt, by the way). If you try it, I’d love to know how it goes! I learned to make laban from my husband’s mother and Sitti. They always got a starter (rawbi) from a friend or relative. I made laban a lot when my children were at home as they loved it on stuffed squash, grape leaves, any stuffed vegetables and as a cold dish with garlic, salt and cucumber and mint (spearmint) The older folk are all gone now and we are the old folk. Fortunately we raise sheep, garlic, cucumbers, squash of all kinds, tomatoes and eggplants and okra and have parsley, dill and basil and spearmint from my mother-in-law’s patch. We even have a grape vine from Sitti’s grape vine which came from the old country. In doing research on how to make laban I came across a procedure for making a starter from organic, raw milk. It involves letting the milk sit out until it sours and curdles and using the curds (about 2T) to make successive batches of fermented milk using the method you describe above until you have the proper taste. You use the remainder from each batch in cooking when sour milk is called for or give your dogs a treat. I am on the 4th batch now and I’m going to test it this evening. It smells right, so wish me luck. By the way, soured raw milk smells good, not like store bought pasturized milk that goes bad and smells just rotten awful. We have been drinking raw milk for about 7 years now and we know the farmer and her cows. No problems and we dislike “store” milk now and won’t drink it. Mother-in-law’s family were Nassar and Sitti’s al Akl, others were Attaya and Khourey. That’s all so fascinating, Barbara. I imagine your local raw milk is wonderful to drink and for laban and labneh. Thank you for sharing! I have been making Laban for years. Love making the cheese too, hanging cheesecloth from kitchen cabinet knob OR setting cheesecloth over strainer and placing strainer over a bowl deep enough that the whey does not touch the laban as it drips. Also, in our family we have always covered the pot with a blanket or large towels, leaving the covered pan/pot in a dark place, even overnight. I don’t think I have ever made Laban without the towels. So I will try one of these other methods. Also, I have a cousin who is half Lebanese; she adds salt initially. I thought that it might kill the culture so I have not chanced adding salt. I had a starter going back probably 50 years or more. I think my starter might have “died” and I am hoping that my cousin whom I promised I would not let it “die” after her passing does not send her rath upon me! I have made Laban with all types of milk. My problem now is finding plain Greek yogurt with live cultures. I live in a small town; I will have to read the fine print. It is so much fun reading all the posts as it brings back such fond memories of my grandparents and parents. I only wish I had paid more attention while they were in action; actions speak louder than words. And oh I woudl give anything if I had the recipe for “Syrian” bread which was made by my neighbor almost every Saturday morning. I lived close enough to smell it when it was being made. (Not really!) But we always went over and got some fresh, hot bread. Sometimes it was the flat bread and sometimes the talames. I have purchased “Syrian” bread at different bakeries in Birmingham, Memphis, Atlanta. None has the seasoning (salt) that my neighbor’s recipe had. Oh for the good ole days! I really love your website. It is authentic Lebanese. 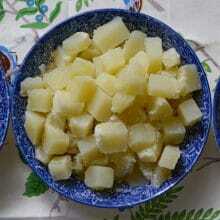 I think it is so interesting about the numerous ways of making kibbie – who is right and who is wrong??? As long as your family is happy, that is what matters. God bless you. Keep going strong. Do you know why when I order kibbie meat and get ready to make it, within several hours, there is usually brown in the middle, rather than red? I do not understand the scientific explanation for this but it is unappetizing to say the least. Even though I know it was freshly ground for me at a local store. I know that when I buy prepackaged meat for hashwi, never is the middle brown. Thank you for an explanation! Georgia, this is a great question and one we’ve wondered about in my family too. The meat contains a pigment called myoglobin, which is that grayish purple/brown color, but it turns pinkish red when it comes into contact with oxygen (when the meat is fresh; it won’t if the meat is bad)–which is why the kibbeh meat goes to pink after it is broken up and sits out for about 15 minutes. Also, the film over the meat at the grocery is permeable, so oxygen gets in and makes that top layer pink. My hushweh meat is the same–interesting that yours isn’t!! Maureen, I love your blog! I am Lebanese and I’ve tried to duplicate my mother’s recipes without much success. She never measures anything! It’s always “A little of this and a pinch of that and a handful of the other”, which can be quite frustrating. My kids always liked their Teta’s cooking much more than mine! Now, with your recipes and exact measurements, my mom has good competition. I’ve made many of your recipes as I find them very similar to my own mother’s meals. I’m making Laban as I write! Thank you so much, and keep up the great work!! I’ve now made about 4 batches of the laban, loving it. And labneh, from each batch, because I can’t find it in my stores anymore..
Two days ago, my 5th batch didn’t set. This is after the best batch I’ve had so far. I re-heated to 115, added a new starter…and yuk. So, here’s the thing. It takes about 2 hours or more for the milk to heat to the 210 degrees per the recipes. I did have one grainy batch, so don’t want to heat it too fast, but it’s taking for-ev-er to make a batch. Any suggestions? Hi Cathy…hmmm. You can reduce the time it takes for your milk to heat to 210 by starting with milk that isn’t so cold; bring it to room temp on the counter or by heating it in the microwave on low power to take the chill off. 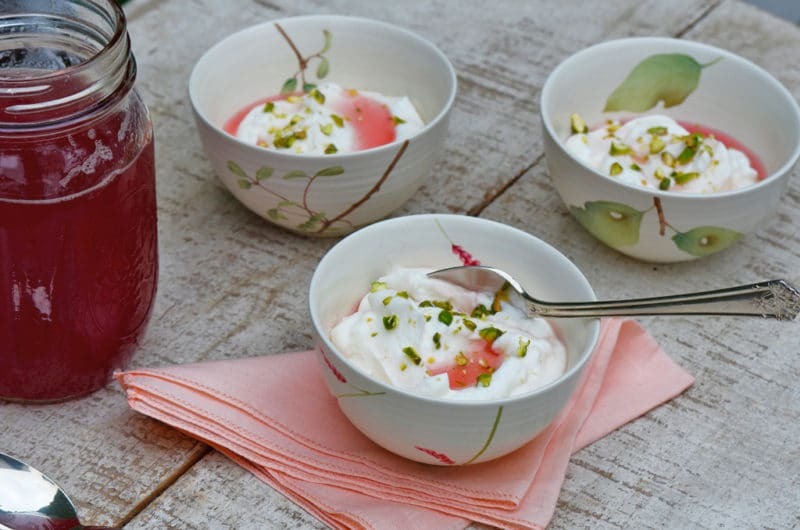 It is so wonderful you are making your own laban and labneh! When my mother passed away, I took her pot of laban from the fridge and brought it home with me. Why? Because she always told me that her Laban was made from starter her mother had given her when she married and she ALWAYS had laban in the fridge…..so I was going to keep that tradition going. I did for about three years however I have to travel quite a bit for work so not knowing how long starter would last, I ultimately threw it all out and cried at the same time. Months later I tried making it with Dannon yogurt, as my mother told me to do as well. It worked. Then again travel kept me away and I threw out the laban. Recently, in the last few months I have tried to make it using the Dannon yogurt as the starter but it comes out rubbery! Yes springy, rubbery. So here I am this morning Googling how to make Laban and find your blog! After reading all the comments I am now ready to tackle another batch! I sure hope it turns out. Just the smell of Laban brings back such great memories. Thanks for being on here, sounds like you grew up just like I did! Hi Cathy…this is so special. I love your desire to carry on this laban-making tradition, and you keep coming back to it. Your mother would be proud! Thank you for sharing this beautiful comment. Can somebody make a video please?. Or direct me to one. I am train to make goat milk yogurt with starters from a Facebook site. They share the grains. I need some guidance in the making yogurt and the straining process. And then I can move on with this receipe. Thanks much. I remember my Sitto, aunt, mom, always had a jar of starter in the fridge. They’d add to it from the liquid that drained from the lebneh. When my mom past away, we looked for the jar. No one could find it. I always wondered who started it and how long it had been around. Oh how disappointing for you to not be able to find your mom’s starter! You will start your own batch and pass on your own starter now, and she would be proud. My name is Robert Kennedy and I am investigating my Lebanese heritage (I know, with a name like Kennedy – right?). My Grandmother was full Lebanese and the daughter of William Jaber and Eva Abood (which was spelled Aboud or Abood). There is a rather large Lebanese community here in Green Bay (Seroogys, Shaloub, Farah..), and they are all related through Lebeanese marriages over the years. They are like family to us but my Lebanese side has no blood ties to them. My Jaber/Abood family had only two surviving daughters, and my grandma (one of the two) married a non-Lebanese man and had three daughters. No one to carry on the Lebanese names. The Seroogy family has done extensive family research and were kind enough to include my Lebanese kin. But they found very little about the Jaber side of the family and found nothing (except for an obituary) for the Abood side. Do you happen to know if you have any Eva’s in your family tree? I know this is a long shot, but I would love to know if you have any information. How interesting Robert. I love these stories and connections and wish I knew of an Eva Abood! We don’t have any specific ties to the Wisconsin Lebanese. It’s just great and important to keep the family trees going though. Thank you for sharing! I just tried to make Laban and it did not work. I followed the recipe from your book that I checked out in the library. I followed the directions very carefully so I am not sure what happened. In the book you call for two tablespoons of plain unsweetened yogurt, but I see in this recipe you call for 1/4 – 1/2 cup of yogurt. Maybe that is why, the starter wasn’t strong enough. Any suggestions? Hi Ginger–I reduced the quantity of starter in the laban recipe in my cookbook because I discovered that less starter makes for smoother laban. Sometimes my laban has not taken and there’s no reasonable explanation! Temperatures make a big difference, but you may want to try it with the larger amount of starter and see if that helps. I promise to try again, it was just very difficult to throw out all that milk. My husband bakes bread, using the levan method. There are days that the starter is doing its job and the bread is flat. I understand that sometimes things don’t work out. I will let the Laban rest in the oven overnight when I do. I did not the first time as I baked a casserole and I was concerned the oven would be too hot to start. Hopefully I can get to it next week. Fingers crossed. I am enjoying your web-site and have put your cookbook on my wish list. Hi Maureen, I did it and successfully made Laban. It is delicious and had some for breakfast with some honey and blueberries. It will now strain it for a couple of hours and go from there. This is exciting. I tried and it didn’t work. I have your book, but I used this recipe because the book is packed away due to a recent move. I used a thermometer. The starter was room temp, as it had been left on the counter before making. It was a bit weird because the starter was very watery before I started and it almost looked curdled. I had just purchased it and it was an organic, whole milk yogurt. What could have happened? I’m sorry your yogurt didn’t turn out! Sounds like it really might have been your starter, though it was high quality so that’s surprising. Try again with a different starter–and if you are concerned about wasting the milk if it doesn’t work, you can do a quart instead of half-gallon. I actually bought some days old raw cow’s milk one time, and turned it into yogurt,,,,….. using some live yogurt as starter. When it was done , I stringed it, and got about 1-1/3 guarts of the original gallon of milk back,, as thick, creamy stringed Greek/Arabic yogurt. The result was excellent, and far and away better than any yogurt I have ever had before or since. I did not cook the milk, I just added the yogurt starter to the raw milk. I would love to make it again, but when raw, grass fed cow’s milk sells for 7 dollars a gallon, …that price makes for a really expensive 1 -1/3 quarts of really good yogurt. Wow, your yogurt with raw milk sounds phenomenal, Robert! Thanks for sharing; I’d love to try it myself sometime. I have not made laban yet, but grew up with it in my home, my grandmother and aunt made it every week, as soon as the last batch was almost gone, they made another. Thank you for the easiest recipe, as I have looked many up and they are all so complicated, it certainly was not for my grandmother and aunt! I definitely want to try to make it I know it is so much healthier than the store bought stuff! Well I’m just so glad you’re going to try making your own laban, Bunny! It’s a wonderful practice and so so good. Let me know how it goes! Hey Maureen, tons of questions about starters. I have deep lebanese heritage. My father made this constantly growing up. His great grandmother’s trick to the start was to use the last portion of your last batch. Follow your directions above, but when you go to make it again, use the saved 1/4 cup from the previous batch – miracles happen from there! Yes, absolutely, this is key for flavor! Thank you for sharing Sheen! This is great but you’re not going to get the traditional Laban flavor from American yogurt cultures. Heirloom cultures have different bacteria which create a nice tart flavor. I have my grandmother’s culture which my family and I have been using for years. And you are right that temperature is everything. I heat my milk either on the stove or in the microwave to 200. Let it cool to 110. I use 1/3 cup laban from the previous batch. I put mine in my dehydrator at 115 which is the perfect temp. 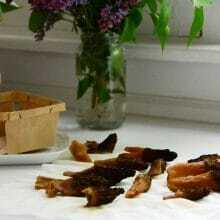 For those who don’t have a dehydrator, you can set it by the hot water heater. If you’re not sure about how warm it is in a certain spot, just do a test run with plain water. Leave it sit overnight and check the temp in the morning. You can purchase Labneh in some middle eastern markets, but if you can’t find that, I would samples some other yogurts like Siggi which is from Bulgaria. It has a tart flavor and live cultures. Thank you for putting these instructions up. It’s always fun to share our culture. Thanks so much for sharing your experience and tips Teresa! During the eighties of last century, I used to live in a tiny Brazilian village with my three small kids, after having lived in countries like Pakistan, India, Sri Lanka, Nepal, Turkey, Lebanon or Egypt and passed through many more. On one day hearing about a herd of water buffalos down at the beach, I immediately thought of using their milk for yogurt, because I knew from five years spent in India that the tastiest, thickest and creamiest yogurt was made with water buffalo milk. So I enquired from my neighbours about who was looking after those animals, and than asked that man if he could supply me with 7 litres of water buffalo milk every morning. He happily agreed. There was no Internet yet, so I just went on with what I must have heard somewhere about how yogurt was made: I brought the milk to boiling point, and let it cool down a bit. For the first batch I used store bought yogurt, stirring some spoonfuls of it into the still warm milk. And waited hopefully. From the first day on, the water buffalo milk never failed to turn into beautiful, rich, semisolid yogurt the way I knew it from India. I asked the village carpenter to build me a small wooden cupboard with wire mesh windows. There the yogurt set and was kept all day long in two big earthenware bowls at my out of the house, open air kitchen. I used the yogurt for my family and my tiny restaurant, and prepared lots of yummy mango lassi. In 1967, at sixteen, I left my family in Switzerland after having faked my dad’s signature to obtain a passport, to travel the world and to learn from life itself rather than from schools and universities, and as an unplanned for side effect, turning into a passionate cook. It was the dishes of the countries I travelled through and lived in that opened to me a hitherto unknown universe of incredible flavours, textures and colours. Having been brought up on the bland, boringly uninspired food of Switzerland, I hardly knew how to boil an egg before starting my travels. Through my travels I also learnt something else of utmost importance to good cooking, something I never would have learnt in my native country: the most important ingredient to truly nurturing, wholesome, delicious food is love: love for our guests, whoever they might be, love for all our fellow human beings, love for life in all its facets and colours. At my place, up to this day and for as long as I’ll be able to stand at the stove, my family, friends, couch surfers and me too, of course, will eat dishes like Kabuli Pilaf, Indian curries, Saudi Kabsa, Moroccan Couscous, Turkish and Syrian dishes, Iranian stews, Palestinian Maqluba, Brazilian Moqueca de Peixe and Egyptian Koshary. Wow! Thank so much for sharing all of this with us! Sharing our food is indeed sharing love, in the most special way.